Forrester Research has named Zift Solutions a Leader in Partner Relationship Management. Ready to learn why? Download the report below! According to Forrester Research, “End-To-End Partner Management Is Critical To Reach New Buyers.” Zift agrees. 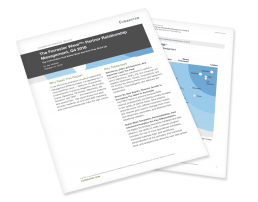 Download your complimentary copy of The Forrester Wave™: Partner Relationship Management (PRM), Q4 2018 to see why Zift is a PRM Leader. “Zift has come together with Relayware and Elastic Grid to create a full-function partner platform that goes beyond PRM to include through-channel marketing and creative/concierge-type services.” — The Forrester Wave™: Partner Relationship Management, Q4 2018.